A moonlight moor. Fairies leading a child. Male Fairies: Do not fear us, earthly maid! From the rustling of our feet. In the green hill’s inmost part. Oh, so happy would we be! And we are so very small! To the fiddle’s rise and fall. Lift their chins and turn away. One whose footfall shakes the ground. Come you, Coltsfoot, Mousetail, come! Come and tease them till the day. In their days of youthful mirth! Wake the larks upon the green. Of their tall, new-fangled queen. And our slaves be as of old. And food and mead is so fair. with tempting romance and beating heart. till mild Autumn comes with leaves and bark. Warm lips, ruby and bold. And fountains on winter stay asleep. 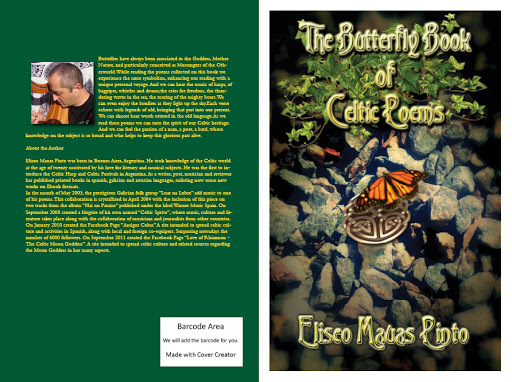 As featured on my book “The Butterfly Book of Celtic Poems” available from Amazon both on Kindle and Paperback formats. “The Butterfly Book of Celtic Poems” is a special collection of poems I began to write from the very first time I felt the magical upbeat of my Celtic heart, with the aim to invite all of you to discover a common tradition, a living identity which should not be alien to those who are partakers and lovers of the Celtic legacy, and the many aspects of bardic poetry in a contemporary society. “The Butterfly Book Of Celtic Poems” Paperback Edition is a cute extended version of the original Kindle format, embelished now with assorted digital artworks created by the author. Butteflies have always been associated to the Goddess, Mother Nature,and particularly conceived as Messengers of the Otherworld. While reading the poems collected on this book we experience the same symbolism, enhancing our reading with an enjoyable Celtic voyage. We transport ourselves to the very same places described in them and it is then that we perceive vivid visual and auditory images. As we read these poems we can taste the spirit of the Celtic heritage. And we can feel the passion of a man, a poet, a bard, whose knowledge on the subject is so broad and who helps to keep this glorious past alive. And we can hear the music of harps, of bagpipes, whistles and drums;the cries for freedom, the thundering waves in the sea, the roaring of the mighty boars. We can even enjoy the bonfires as they light up the sky.Each verse echoes with legends of old, bringing that past into our present. We can almost hear words uttered in the old language. And lift it good and high. When dawn illumes the sky. And rout the hosts of Dole. And ease the troubled soul. As in the ancient days. –J.K. BANGS in Harper’s Weekly, Nov. 5, 1910. Who’s dat peekin’ in de do’? On mah way to meetin’. Who’s dat by de winder-sill? Eyes is sort o’ teary. Hoppin’ sof’ly as a toad? Come to tell me howdy. Wid dem spookses roun’ me. When dem folks surroun’ me. Off dar by de gyardin? Ef it ain’t my Sammy! Sambo, what yo’ doin’ dar? Yo’ can’t skeer yo’ mammy! –CARLYLE SMITH in Harper’s Weekly, Oct. 29, 1910. Show what wonders come to pass. Those queer, coof-like pranks recall? –JOEL BENTON in Harper’s Weekly, Oct. 31, 1896. Sign of this carnival of mirth. It is the witching Hallowe’en. It is the mystic Hallowe’en. It is the haunting Hallowe’en. –A.F. MURRAY in Harper’s Weekly, Oct. 30, 1909. Hop-tu-naa! guess where I ran ? Hop-tu-naa! guess what I saw there ? before we run away with the light of the moon ? To find it when night falls laid on a golden bier. I hear the harp-string praise them, or hear their mournful talk. Even in an old story, is a burden not to be borne.